On Sunday, October 2, 2011 from 2-5 pm at Bigham Knoll in Historic Jacksonville, OR. 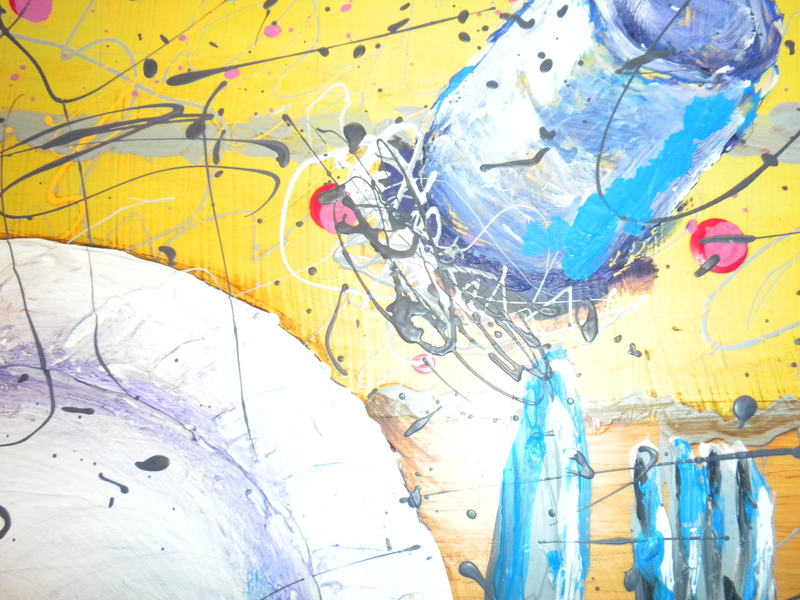 I will be donating a piece of furnARTure to the Studio at Living Opportunities for auction. One of my favorite local ways to volunteer is at The Studio for Living Opportunities. 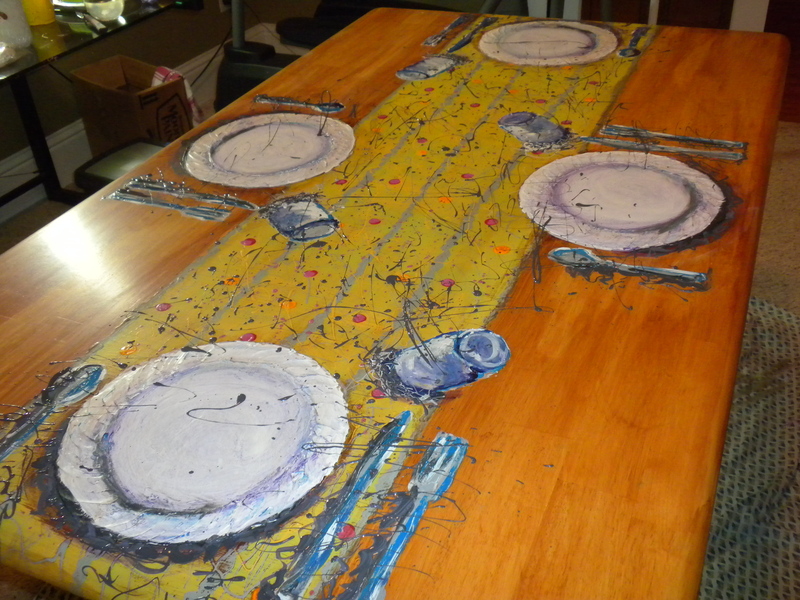 This year I will be donating a painted piece of furniture for the “FurnARTure Auction” My piece this year is a kitchen table painted to look like it is already set. I procrastinated on this project all summer, but sometimes one just needs a little pressure to get things going. 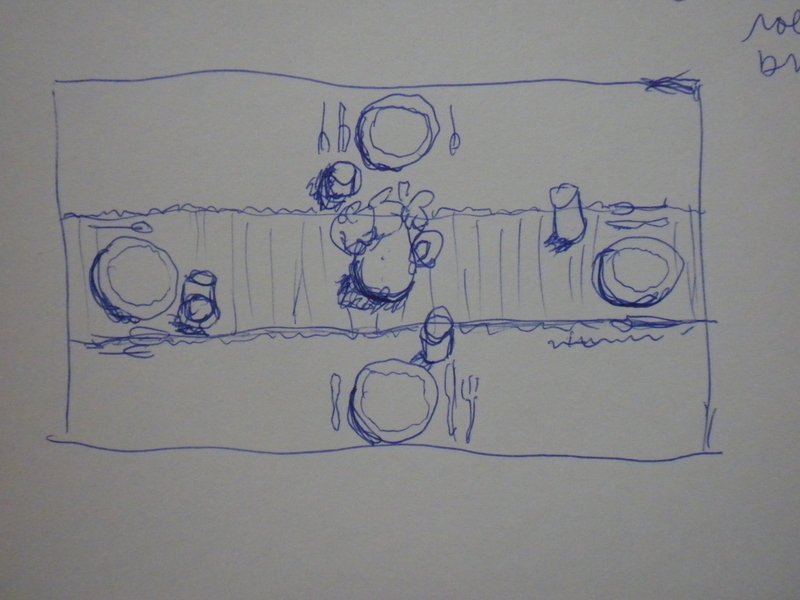 I had many ideas, but finally decided on the sketch below. 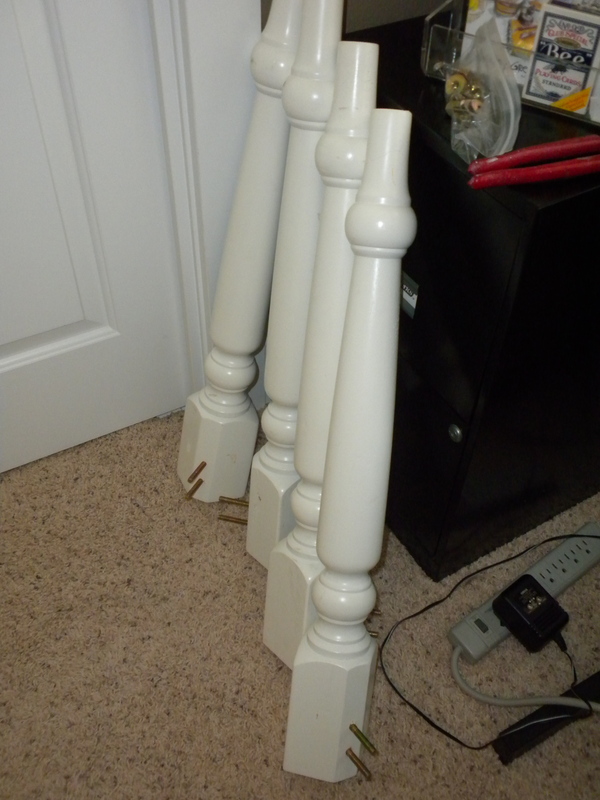 I removed the legs from the table in order to actually move it. 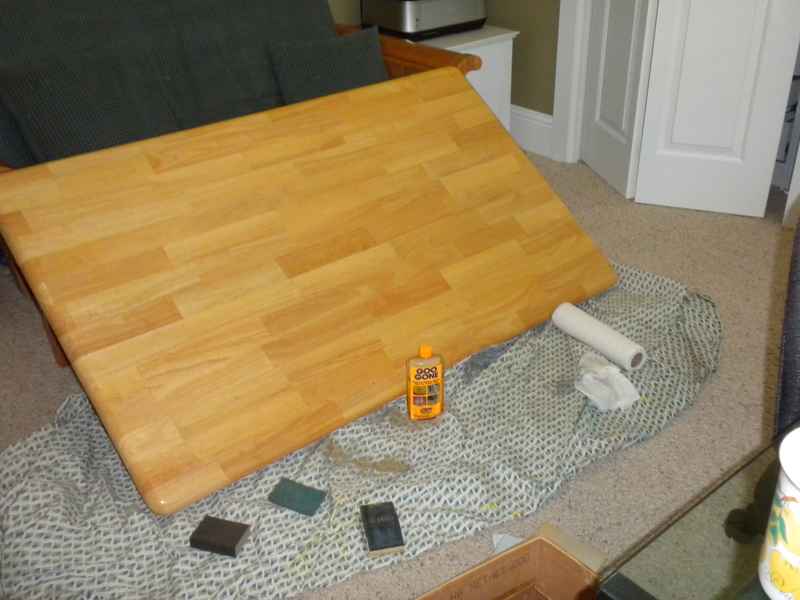 The table is solid wood and is quite heavy. 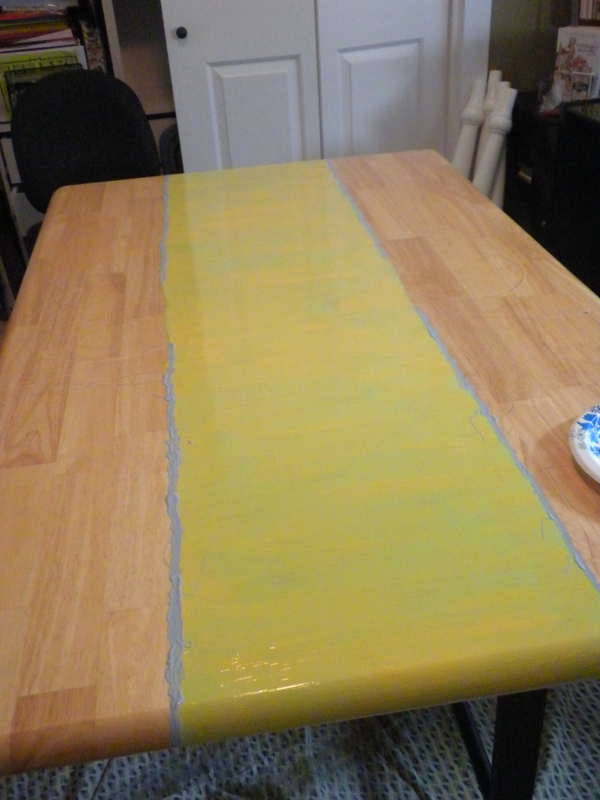 Then I sanded and prepared the table for paint. 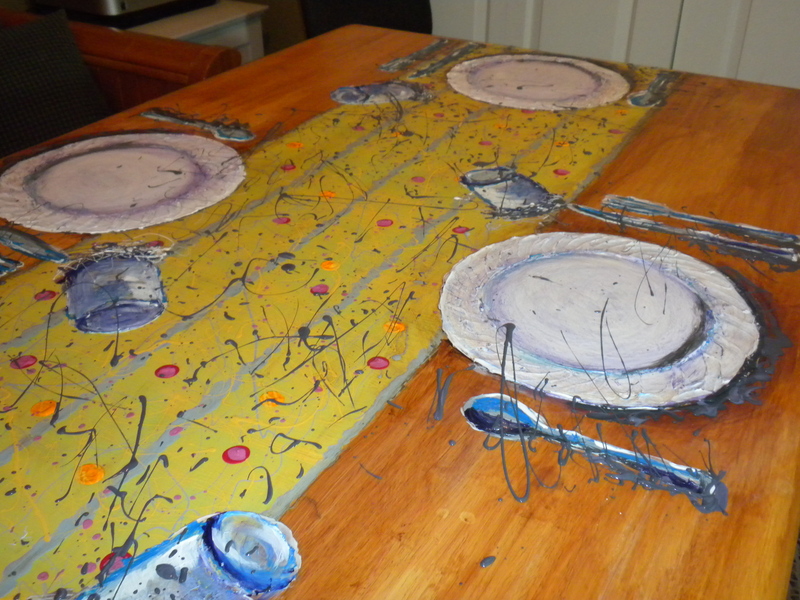 Look below and you will see some of my process as I painted the table runner, plates and cups. 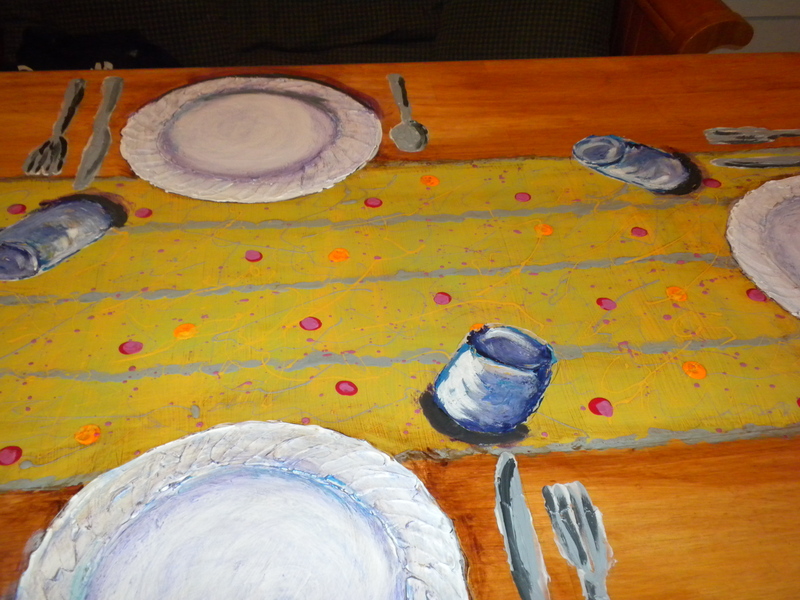 I wanted the table setting to look real, but not be too literal so I used a gel medium to build up the paint and create a lot of texture. 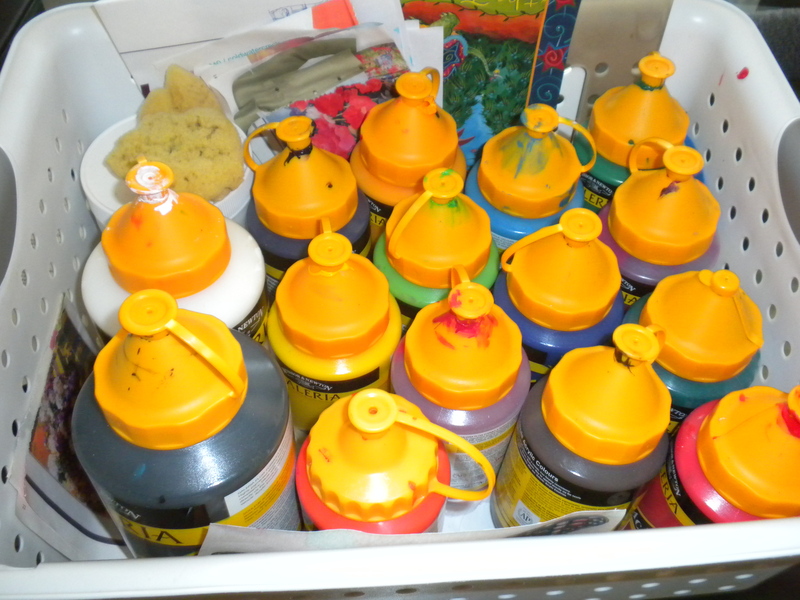 Most of the paint is house paint from Benjamin Moore left over from painting our home seven years ago. 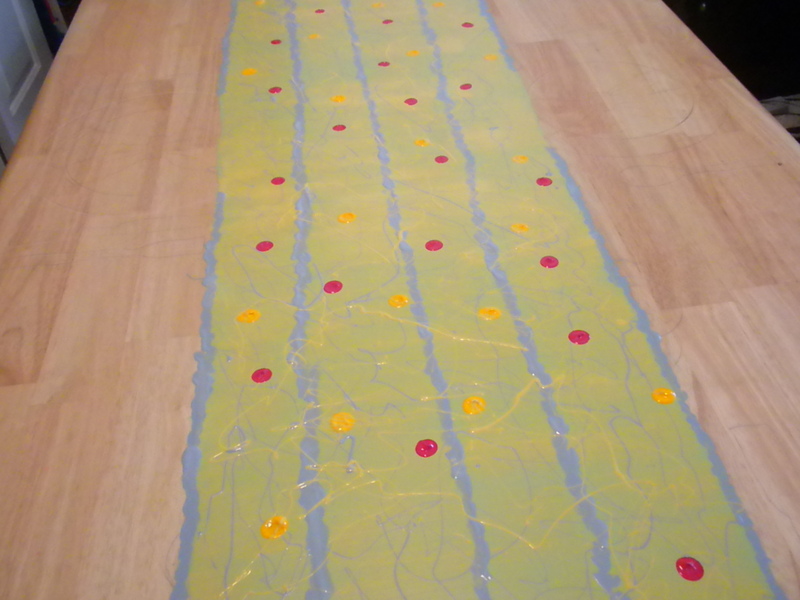 I also used some bright acrylics when needed. The finished piece of furniture or in this case FurnARTture. The perspective changes for each setting. In order for the person sitting at the table to not feel like their glass was tipping over, I decided this would be the most fun. 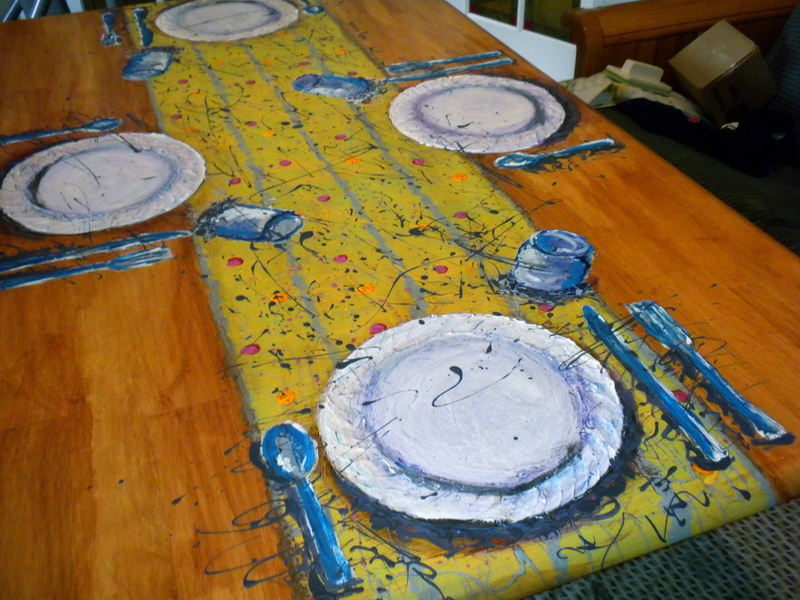 The perspective also entices one to walk around the table and look at it from each view, making this piece of art interactive, and functional too. Last Friday evening my table, along with other FurnArture, was on display at The Studio at 32 Central—across from the Ginger Roger Theater. 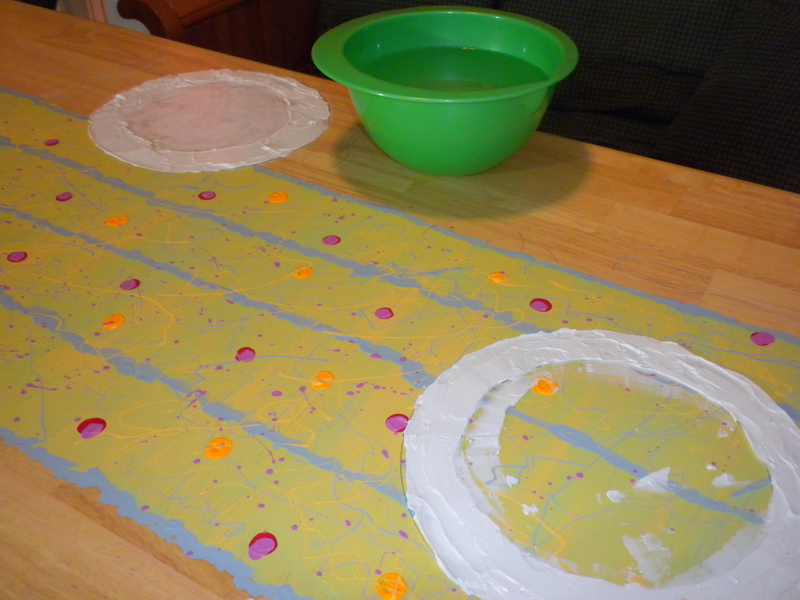 It was such a joy to watch people walk through the door and say “wow” and walk over a feel the table. 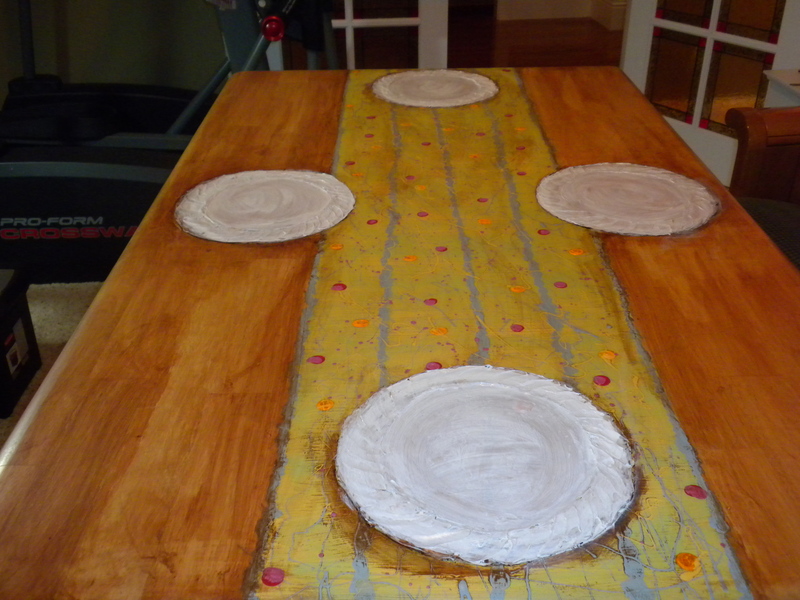 This table and most of my acrylic paintings are very textural. Part of the experience with my acrylic artwork is touching the piece and I want people to do that. My piece and the other FurnARTure will be on display at Terra Firma Home on Main in Medford until the auction at Bigham Knoll in Jacksonville on October 2, 2011. If you are interested in bidding on this piece, you will need to attend the furARTure auction at Bigham Knoll in Jacksonville on October 2, 2011. 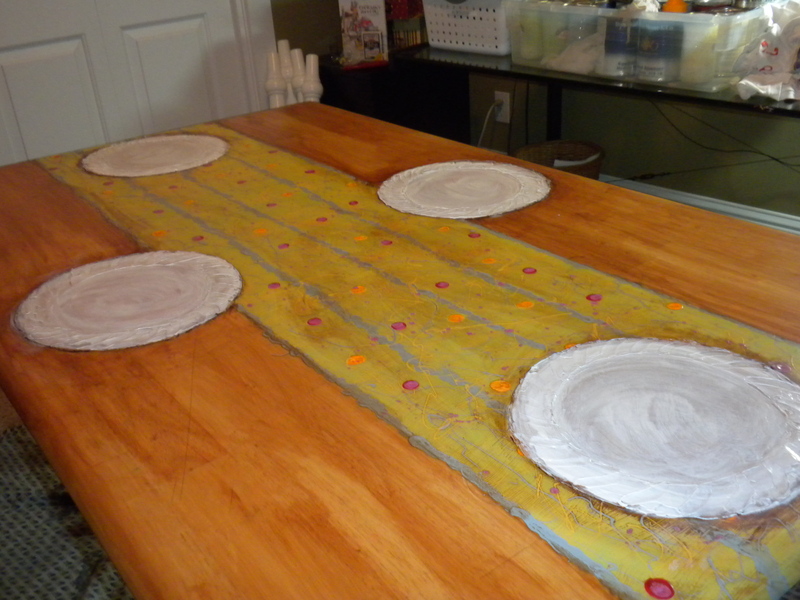 Proceeds from this table will be donated to my favorite charity, The Studio at Living Opportunities here in Medford. If you would like to commission a painted piece of furniture, you can use my contact me tab on the top right of my web page. This entry was posted in Art, graphic design, graphic design illustration, graphic design studio, hollyherick.com, Painted Furniture and tagged Acrylic Paint, Auction, Benjamin Moore, Bigham Knoll, Donation, furnARTure, Furniture, Home and Garden, Jacksonville, Kitchen, kitchen table, Living Oppotunities, Medford Oregon, paint, painted fruniture, Placemat, Shopping, The studio at Living Opportunities, third friday artwalk. Bookmark the permalink. Son living in studio/office: I am at a stand still, yet it is good! 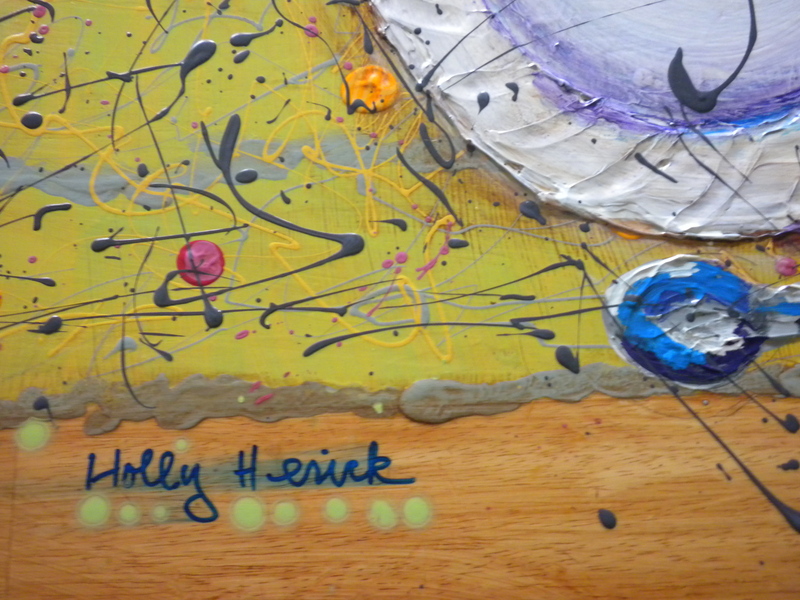 Holly, I love the table. It is a great idea. 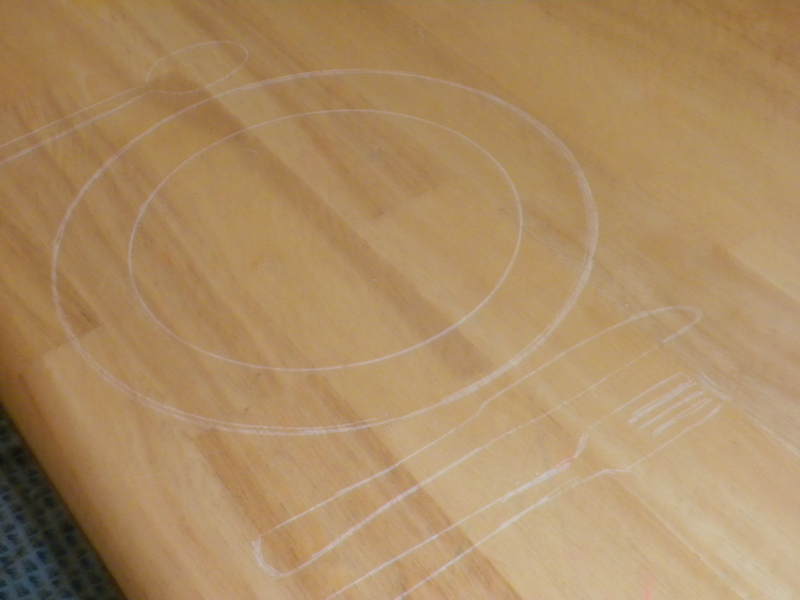 I cannot wait to see what you do with the new table. Thanks for donating the table Mollie. I am fighting with my girls about who gets to paint it. I will send you a photo for sure. We really appreciate it, and so does The Studio at Living Opportunities!